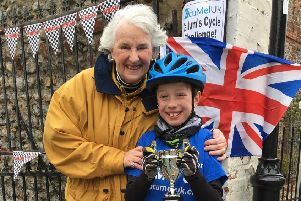 Olympic gold medallist Sally Gunnel​l OBE has said learning that her son’s ‘agonising migraines’ were caused by a wheat intolerance was a ‘life changing’ discovery. The 52-year-old, from Steyning, said the migraines suffered by Luca, now 17, from when he was a just a toddler were so bad that she and her husband, Jonathan Bigg, feared he might have a brain tumour. They admitted him from numerous tests – but the family only got to the root of the issue after taking a food intolerance test, which signalled that Luca was sensitive to wheat. And after cutting it from his diet, Luca’s nightmarish headaches suddenly stopped, Sally said. Sally, who is also mother to Finley, 20 and Marley, 13​, said she wished he had been tested years ago and urged other people to take a food intolerance test. The track and field athlete, who won the 1992 Olympic gold medal in the 400-metre hurdle in Barcelona, Spain, said: “Discovering the food intolerances has honestly been life changing for me, and even more so for my sons, particularly Luca. “He used to be quite argumentative and difficult, as a lot of kids can be. “But how many kids’ issues do we put down to their age and hormones when actually it could be down to the types of foods they’re eating? “Luca had headaches for absolutely years, suffering with migraines that would have him bed-ridden. “His moods were always low and he was always so tired as a child that he’d have to go to bed early. He’d be argumentative, and also quite edgy. “And now we know it was down to wheat - not hormones. Not his age, but an intolerance to wheat. Sally said the family learned of Luca’s food intolerance after they took a Food&DrinkScan Premium, supplied by UK firm YorkTest Laboratories, in August last year. Through a finger prick blood analysis, YorkTest is able to measure spikes in something called ‘food-specific IgG’ antibodies, a spokesman for the company said. These IgG reactions go hand in hand with gut imbalances and inflammation, according to the spokesman. Sally said: “Luca’s headaches were a real worry. In fact, the situation got so bad we started to think he might have a brain tumour, as the headaches came so often and were so severe. “We saw doctors, specialists, kinesiologists, everyone you could think of. “As a mum you start thinking, ‘Oh my God what’s triggering all this?’. Sally said her eldest son Finley, who is also a promising athlete, has benefitted from taking the test too after it revealed a sensitivity to dairy and wheat. She said: “Finley is an 800 metre runner and he’s found that cutting out dairy and wheat has really helped him, especially with his recovery. “He’s also training better because he finds he can breathe better, as if identifying the food intolerance† has opened up his airways. Sally herself, who retired in 1997, said she discovered she had intolerances to eggs and cow’s milk – and that cutting them out has helped her rediscover her sense of smell. She said: “During all my years as an athlete, I actually struggled to breathe through my nose and had no sense of smell. “And I always had to breathe through my mouth when training. But I never realised what was causing the issue. “Who knows what could have happened with my running had I been able to identify the cause sooner? I certainly would have been able to train harder. “Instead, I always felt nasally and bunged-up. Now I can breathe through my nose and smell things. She added that her intolerance to eggs would also make her eyes appear swollen and red. She said: “It started happening around 10 years ago and would usually affect my right eye. Dr Gill Hart, a Biochemist and Scientific Director at YorkTest Laboratories, said food intolerances were different to allergies – which affect the body’s immune system and often cause almost instant reactions. In contrast, intolerances can take 72 hours to appear, making it very difficult to pinpoint the offending food, she said. Common symptoms of food intolerence include tummy pain, bloating, wind, diarrhoea, skin rashes and even itching, she said. She said: “The reactions you get with an IgG reaction to foods can cause inflammation. “And this inflammation can then cause a range of problems in different parts of the body – not necessarily in the gut. “In the case of Sally’s family, it manifested as lethargy and extreme headaches in her son – which are some of the more common symptoms. “The key thing for parents is not to dismiss their child’s tempers and tantrums as simply a sign they’re going through a ‘phase’, or that their hormones are running riot.